The apps themselves are very similar to what the Wall Street Journal recently launched with its “WSJ Social” app (the Journal wasn’t part of the official Facebook launch, and says it came up with the app on its own). 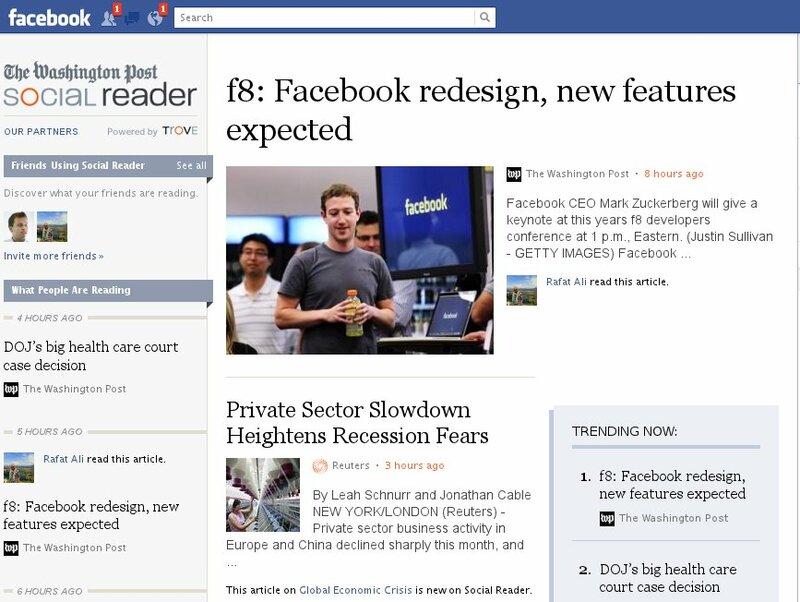 It’s a digital reader that lives inside the social network and allows logged in users to read stories (unless they happen to be behind the Journal’s paywall, of course) and also lets other Facebook users follow that reading activity — turning their friends into real-time “editors” of the content they see. As with the other apps Facebook announced, that reading behavior will also show up in the new “ticker” view of users’ activity (if users agree to allow this to happen). So the Washington Post social app, for example — known as Social Reader — looks like a cross between a traditional Facebook page and a stripped-down version of a newspaper page, with blocks for articles and images, and then beneath that the faces of people who have shared an article (the articles also have the time that they were published or updated in red, which is unusual for a newspaper website). And the app features a “trending now” box that shows which articles are the most read or shared at that time, and the stories that appear in the newspaper view are chosen based on algorithms powered by Trove, the news-recommendation service the Washington Post launched earlier this year. Among the obvious reasons for media companies to hitch their digital wagons to Facebook’s star are the sheer quantity of potential readers who are using the network: According to Zuckerberg’s keynote on Thursday, Facebook recently crossed a new milestone when over 500 million used the site in a single day. As Alisa Bowen, general manager of the WSJ Digital Network put it, the newspaper created the app so that it could “reach people where they are” — and the sharing that’s built into the platform can accelerate that process immensely. Media companies could also theoretically learn things about what content their readers prefer (as well as what times they like to read, etc.) 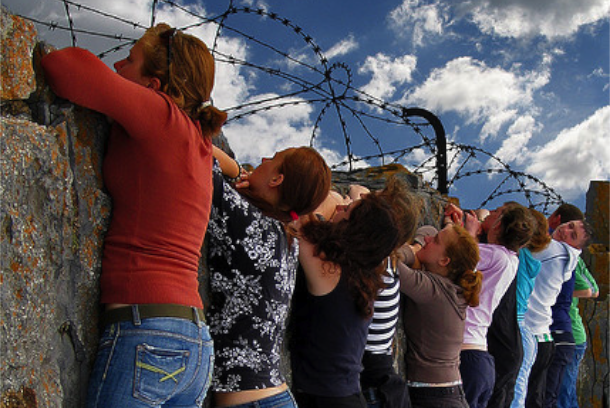 by looking at the analytics that Facebook provides about users’ behavior. Those benefits, however, would be just as available to media companies without having to create apps that live inside what Ethernet inventor and web guru Vint Cerf recently called Facebook’s “walled garden.” In fact, if there’s one thing that makes the current partnerships between content companies and Facebook different from the deals they struck with AOL and CompuServe and other online “portals” in the early 1990s — a comparison some made when the WSJ launched its app — it’s that most of them already have full-fledged and highly trafficked websites of their own. In the early 1990s, one of the reasons to hook up with AOL was simply that no one really understood the web at that point. And as The Huffington Post and some other new-media entities have already shown, many of the advantages Facebook was selling with its app pitch — the sharing, the analytics, the user experience, etc. — are already available with the Facebook open-graph API and platform, which the social network launched at its last f8 conference. In addition to the ubiquitous “like” button and other widgets, that allowed the Huffington Post and other sites to show who among your friends had read or commented on a particular article, and made it easy for users to share those articles themselves as well, including posting that activity back to their Facebook wall as status updates. It’s interesting to note that one media partner announced by Facebook has taken a very different approach from the social-reading apps that live inside the social network: Yahoo News — which just happens to be owned by another large (if somewhat faded) web portal — chose to use the new Facebook social platform to do something very similar to what the Huffington Post and others have. So instead of forcing users to remain inside a Facebook page, clicking a Yahoo link takes you to a webpage at Yahoo’s site with social features embedded in it, such as a filmstrip-style view of all your friends who have clicked the same link. That way, Yahoo keeps the traffic and engagement. So what do the new social apps offer that the existing platform doesn’t? The most obvious answer is that it pulls all that reading and sharing activity back into Facebook’s garden. Instead of readers just browsing through the Washington Post or Guardian site and links appearing on a Facebook page when they “like” something, users are now being encouraged to go to a specific Facebook page and spend all of their time inside that page, reading and sharing and commenting. That activity exists only inside Facebook (for now, at least) and is only visible to logged-in Facebook users. That’s an awful lot of power and control to hand over to a service that holds on fairly tightly to the data produced by its users. Yes, Facebook provides huge potential audiences, and there are benefits to knowing who your readers are at all times — just as there are benefits to handing over control of the comments on your newspaper’s website to Facebook. But there are risks to doing this as well, as I’ve pointed out before. Facebook can be a very powerful friend for media companies in all kinds of ways, but they need to remember that this power exists for the benefit of one company: Facebook. Yep. I think one would need to be drinking deeply of the Cool-Aid on display on Mashable, etc. over the last few days to think that people will start consuming all of their news via “apps” inside Facebook. Which makes me wonder what the WaPo & The Guardian are doing. Do they expect CNN, BBC, the NYTimes, NYMag, ESPN, and every other publisher to follow them in there? If so, where’s the advantage over the present situation? (There’s a massive disadvantage as they will have joyfully marched into the sausage factory to become mere ‘Facebook content’ alongside baby pictures and jealousy-inducing vacation snaps.) Or do they plan to be part of a few select publishers that supply their content to news pages within Facebook? If the latter, the move might make sense as long as they can gather loads of data on users, drive engagement, and get a big cut of ad revenue. But the advantage gets diluted quick as other brands pile on and their own sites lose traffic and Facebook Connect data. Perhaps I’ve misunderstood something fundamental here, but I agree that overall this does not seem a winning move for publishers. The portal comparison is apt. i saw a piece on cbc the other night where they got the opinion of a “social media expert”. if you run into any up there in canada would you please ask them what sort of expert they were 2 or 3 years ago before the term was coined? and if you ever need the opinion of someone without a facebook or twitter account, please drop me a line. Thanks for the comment, Burke. I am totally in favor of media companies boosting engagement and encouraging sharing, etc. But I think there are lots of ways of doing that by just connecting to Facebook, as opposed to handing over all their content.